Day 1 Welcome to Turkey. Arrive in Izmir airport or port in the morning, meet by our representative and start your tour to Pergamum. Day 2 After breakfast at the hotel, depart for the tour of Pamukkale, warm calcius-laden mineral waters spring from the earth to cascade over a steep cliff, forming gleaming white travertine pools. The Romans built the health spa of Hierapolis here. 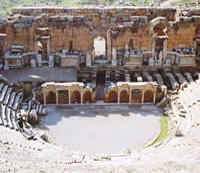 After the touring of this ancient city Hierapolis continue to your hotel. Day 3 Depart for the tour of marvelous Ephesus ancient city, once the capital of Roman Asia, is the best preserved Greco-Roman classical city on the Mediterranean. By the end of the tour continue to Izmir airport with your guide for your flight to Istanbul.